I finally made my first BBQ order. I have to tell you that I have NEVER TASTED ANYTHING SO TENDER! Unbelievable very good! I shared some with my friends and their expressions on their faces is priceless! The comments are: Wow this is so tender and moist! I am looking forward in placing another order next month. God Bless you and continued success Don! Don, It was delicious dude and the best brisket that everyone has ever tasted. We had two other couple come over to eat and they all loved your food. You need to patent your stuff dude. I will be ordering some more after the holidays. You have something special my friend. I have had many types of BBQ over the years. It takes a certain type of person who can cook BBQ (chicken, pork, beef and ribs) on a consistent basis of excellent flavor and tenderness. 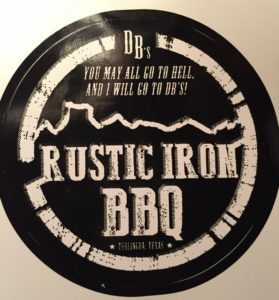 It has a unique blend of seasoning and the slow cooking technique that makes DB’s Rustic Iron BBQ an excellent choice. Eat and Enjoy..
Everyone here that has tasted your brisket has the same comments; excellent! Best ever. My father in law commented that it is the best brisket he had ever had………. As for the sauce, it is also excellent. All who have tasted agreed that it was excellent. So far we've only used on burgers but it is now my favorite BBQ sauce.